Official global version of Xiaomi products is what xiaomi especially made for overseas mi fans. The differences of it as follows Support Android 4.4 or above and iOS 7.0 or above with Bluetooth 4.0. XIAOMI MI BAND BAND MUSIC MI 2 OLED SMART BRACELET BEST ALGORITHM PULSE PULSE IP67 MI VERSION 2.0 BLACK & # XFF09 MGW4024GL. Compatible with - Xiaomi. Mi Band 2 uses an OLED display to let you see more with a single glance. 1x Wristband for xiaomi smart bracelet 2. - Fashion, stylish and durable, Easy and simple to use. 1x Wristband for xiaomi smart bracelet 2. Redmi Note,Redmi Note2, Note3, xiaomi MI5 4S XIAOMI MAX. For smart unlock features Xiaomi (MIUI 6 and above): Mi2/2S/2A, Mi3, Mi4, Mi Note, Mi4C, Redmi 1S, Redmi 2/2A. ADI ultra-low power acceleration sensors Optical heart rate sensor. Wearable wrist band / wrist strap for XIAOMI MI Band 2. New wrist strap miband 2 strap ,mi band 2 wrist strap. (1)PlS know well this is just wrist strap for miband 2 band ,colorful strap for your avaible choose,It is 1:1 style strap for miband 2 fitness smartband,fashion strap for your healthy. New Original Xiaomi Mi Band Band Music Mi 2 OLED Smart Bracelet Best Algorithm Pulse Pulse IP67 (Mi Version 2.0 Black & # xFF09. Product Details Date First Available: 17 Jun. 2016. (included). Compatible with: Muñequera. ). 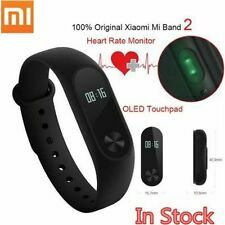 Xiaomi New Original Mi Band Band Music Mi 2 OLED Smart Bracelet Best Algorithm Pulse Pulse IP67 (Mi Version 2.0 Black & # xFF09. We take our reputation seriously. Product Details Date First Available: 17 Jun. 2016. ). Wearable wrist band / wrist strap for XIAOMI MI Band 2. Color: Mi Band 2 Orange. General Interest. We are here to help! Material: TPU TPE. Wearable wrist band / wrist strap for XIAOMI MI Band 2. Color: Mi Band 2 Teagreen. General Interest. We are here to help! Material: TPU TPE.